Did you know ! Around 60% of removable media devices such as USB flash drives and Pen drives were dumped for software errors, thinking it does not work any longer, which requires only a simple troubleshoot, in some rare cases even new devices were also kept idle (or) dumped else return back to retailer reporting as a faulty device. And one common issue to dump/destroy the removable media disk is "Drives detected but not listed on my computer", for accessing files and folders in it. This could occur due to the accidental removal of device drive letter from the system volume (or) failure of the Operating System to name and partition the drive volume at the time of installing the device driver files. The drive letter is the name of the drives (system volume) which is used as an address by the operating system to access the drive , so removing the identity of the driver will probably remove it from my computer list. How to Fix USB Flash Drive Detected But Not Showing In My Computer Problem ? whenever a new device injected into the computer, the system detects the plugged-in device then automatically search and install the appropriate driver files for access. Sometimes due to failure of some of its driver files, which results in un-allocated disk space, may cause your device to disappear from the My computer list, but still detected by the system. Hope you are here to fix the issue "USB flash drive are recognized but not showing in my computer", this is simple then you think, just follow these simple steps to fix this issue. Open run command prompt and type diskmgmt.msc and hit enter. Immediately device management window will open prompt. Blue bar on disk drives represent the disk is allocated. 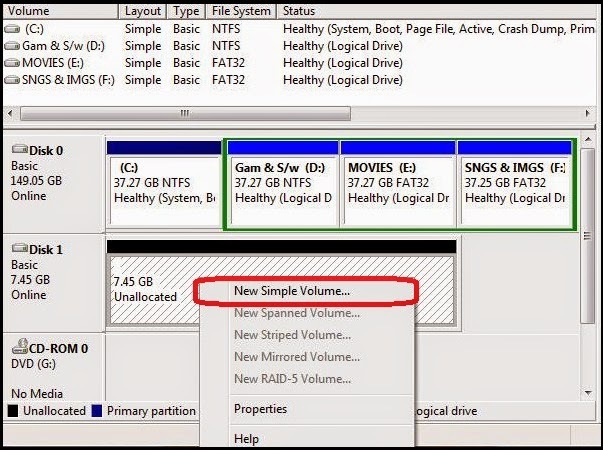 If the drives are Un-Allocated right click on the un-allocated Pen drive and select New system volume, to create a new partition to allocate disk space. A new simple volume wizard prompts then click next. Then assign the size of the system volume of the disk to be used in MB. Assign the size of the volume to be used. Name the volume with any label and click next to complete the process. Read Also: How to test USB flash drive/thumb drive read and write speed. 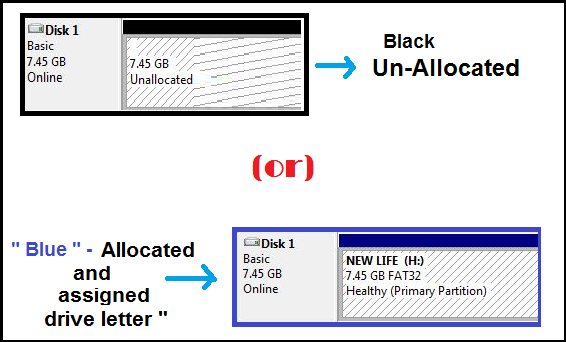 Method 2: If the drives are allocated disk space but not accessible. Warning: Changing the drive letter to un-hide/display the USB drive in Window's Explorer requires formatting of the USB disk to be accessible then ON. So if the files in the USB disk are required, we urge you to create backup's before proceeding with the below steps. Right click on the pendrive and select change drive letter and path. A window pop ups immediately, click change to assign a different drive letter for the pen drive. (Note: Make sure you assign a drive letter, that is not assigned to any other drives in the system). Once the drive letter is successfully changed, it must appear in the My computer disk drives list, if not restart the computer. Note: Disk Management utility command is same for all version of windows operating system, so the above methods can be applied to any version of windows OS. Hope you enjoy this article do comment below for any queries, and also like and share this article with your friends and family. My drive appears as Disk1 in Disk management and right beneath it is No Media just as CD-Rom appears in your illustration and you can only view properties and change drive path letter without formatting and even after changing drive letter it tries appearing in my computer but vanishes within a second.Hope you can help me. sir i tried method 1 but it showing " incorrect function". now what should i do..
After opening disk management box and after right click there when i tried to change the drive letter it showed a dialogue box with file location is unspecified. in 2nd method after right clicking on the pendrive "change drive letter and paths" option is not hightlighted. 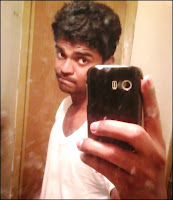 what should i do now. My 32 GB sundisk pendrive sown in divace manager but not sow in my computer.ialso try sow in disk menager but it sow in black colur and i wtright click on it only open properties dilog box.so how can i formet it?i atech it settopbox and it write protected.i want to formet it but i uneble it.so how can i do? My reomoval disk (hp 32 gp) is showing in the disk management . Please help me to solve this problem.